A Shabbat meal is always special, and demands the most beautiful utensils and table settings to observe properly. The right Shabbat accessories represent good taste and reverence through the principle of Hiddur Mitzvah, or the beautification of a practice. 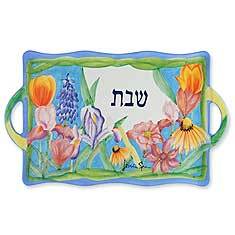 Shabbat accessories make outstanding gifts for any occasion, and Zion Judaica is home to the Internet’s largest selection of fine Judaica suitable for beautifying a table. Zion Judaica has everything you need to make sure your special dinner setting is anything but ordinary. Our complete fused glass Shabbat serving sets include trays, wine service cups and other accessories all matched up for an elegant unified look. We also have crystal wine decanters and tablecloth covers to enhance the effect along with napkin rings in sterling silver or painted wood. We even have embroidered kitchen towels featuring traditional Hebrew imagery so that every piece can reflect the festive mood. Detail is always key in presentation during shabbos meals, and our colorful bottle corks, toothpick stands and salt and pepper shakers will let everyone know that something is a little different tonight. Add visual interest to your table setting with a porcelain Shabbat serving tray, beautiful floral salt dishes cast in fine pewter, and laser cut trivets to protect your Shabbat table from heat damage while enjoying your delicious bounty. All of these items would be welcome on the finest Shabbat tables, and make excellent gifts for the stylish person in your life. Come to Zion Judaica for all your Shabbat gift needs.